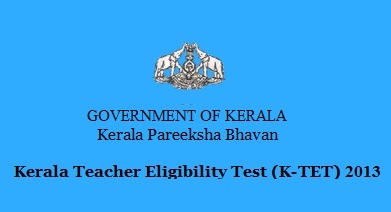 Department of School Education, Government of Kerala has invites online application for Kerala Teacher Eligibility Test (K-TET 2013). Kerala TET 2013 Exam will be Hold on Saturday, 28th September, 2013. Category IV - Language Teachers, Specialist Teachers and Physical Education Teachers. Application Fee: Rs. 500, Rs. 250 for SC/ST candidates. Last Date for Submission of Online Application : 24.08.2013. Downloading Admit Card Through Website : From 09.09.2013 to 27.09.2013.